On Friday evening, the Duke & Duchess of Cambridge along with Prince Harry welcomed President Barack Obama and First Lady Michelle to their London home for dinner. The royal trio waited on the steps of Apartment 1A in Kensington Palace for their distinguished guests to arrive. The young royals looked perfectly coordinated in blue toned outfits. Kate wore a new dress by her favorite high-street label LK Bennett. She donned the brand's current season'Addison' printed silk dress (£325). The jewel-toned dress is made from 100% silk and features sheer sleeves and ankle grazing length. Kate added a navy belt, the same one she wore with the Glamorous maxi dress during the royal tour of India. On her feet were the Rupert Sanderson 'Malory' 100mm high heel pumps. Kate accessorized with her G. Collins Tanzanite Pendant Necklace & Earrings. As staff opened the black double doors, the group walked into a hallway where another guest stood in the distance to greet the visitors. Much to the delight of the President and First lady, inside stood Prince George dressed in his jammies and robe. 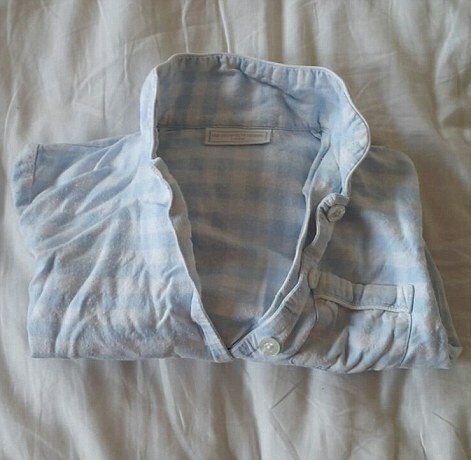 Prince George wore a personalised gingham robe by My1styears.com (£27) atop blue check pajamas from the White Company. On his feet were navy Little Boston Plane slippers by Trotters (£18). The Cambridges hosted the Obamas in the drawing room. This is the first time the public has got glimpse of the royal couple's newly renovated 22-room apartment. Also on display was a soft toy dog - another gift from the Obamas, given to George when Princess Charlotte was born. It is a replica of the First Family's Portuguese water dog, Bo. You can pick one up at Amazon. If anyone is interested, the Daily Mail has a break-down of the Drawing Room decor. Queen Elizabeth II celebrated her 90th birthday today. Her Majesty spent the day at Windsor Castle were she was greeted by huge cheering crowds. In the evening, Prince Charles hosted a private birthday dinner for his mother. More than 30 members of the Royal Family were among the 71 guests attending the formal dinner, including the Duke and Duchess of Cambridge and Prince Harry. IKON Pictures shared this image on Twitter of the royal trio leaving Kensington Palace en route to Windsor Castle. From the limited photo it looks like Kate is wearing a new green lace dress. The What Kate Wore community have suggested it may be by Temperley London because the lace details look very similar to the designer's 'Amoret' gown. Here's a closer look at the lace detail of the new dress compared to the 'Amoret' gown. I'll update the post if anymore photos emerge.